A file image of a Shenzhen Airlines plane at Hong Kong International Airport. The state-run news agency says the airlines received "false bomb threats"
Beijing (CNN) -- Three Chinese airlines received "false bomb threats" on Wednesday that caused disruption to five different domestic flights destined for the southern city of Shenzhen, state-run media reported. 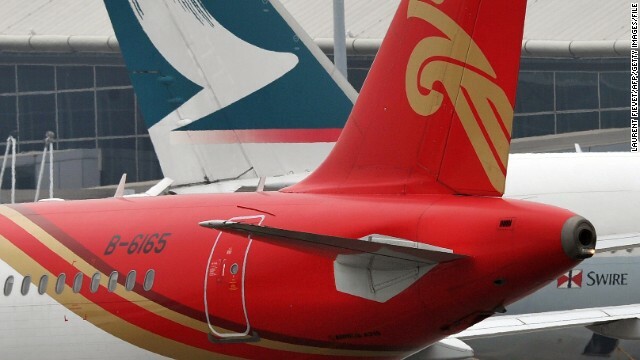 Shenzhen Airlines said on its official microblog account that it had received multiple threats that lead it to reroute two flights and delay another. A flight to Shenzhen operated by Juneyao Airlines returned to Shanghai, its point of departure, so that the plane, passengers and baggage could all be checked following a threat, the state-run news agency Xinhua reported. The flight eventually took off using a different plane, the news agency said. China Eastern Airlines received a threat regarding its flight from the northern city of Lanzhou to Shenzhen, via the central city of Xi'an, Xinhua reported. The flight was subsequently cleared for takeoff, it said. According to China Eastern's website, the flight's departure from Xi'an to Shenzhen was delayed by more than two hours. Shenzhen Airlines said that a flight from the eastern city of Nanjing returned to its point of departure, a flight from Xi'an changed course to land in the southwestern city of Guilin, and a flight from Beijing departed late after police talked to passengers. Police are now investigating the case, according to Xinhua and Shenzhen Airlines. Asked for further comment on the threats, Shenzhen Airlines directed inquiries to the individual airports where the threats were received. CNN's Feng Ke contributed to this report. David McKenzie meets some American teenagers who are spending a year in China to be fully immersed in the culture. The Chinese government pledges to protect a boy with HIV, who was shunned by his entire village in Sichuan, state media reported. A Chinese couple allegedly threw hot water on a flight attendant and threatened to blow up the plane. China's 1.3 billion citizens may soon find it much harder to belt out their national anthem at will. Los Angeles in the last century went through its own smog crisis. The city's mayor says LA's experience delivers valuable lessons for Beijing. At the height of his power, security chief Zhou Yongkang controlled China's police, spy agencies and courts. Now, he's under arrest. China says it will end organ transplants from executed prisoners but tradition means that donors are unlikely to make up the shortfall. China's skylines could look a lot more uniform in the years to come, if a statement by a top Beijing official is to believed. Despite a high-profile anti-corruption drive, China's position on an international corruption index has deteriorated in the past year. A daring cross-border raid by one of Russian President Vladimir Putin's associates has -- so far -- yet to sour Sino-Russian relations. A 24-hour bookstore in Taipei is a popular hangout for both hipsters and bookworms. China is building an island in the South China Sea that could accommodate an airstrip, according to IHS Jane's Defence Weekly. North Korean refugees and defectors face a daunting journey to reach asylum in South Korea, with gangs of smugglers the only option. China and "probably one or two other" countries have the capacity to shut down the nation's power grid and other critical infrastructure.